Hi, I am interested in your 1969 Ford Mustang (stock #0938-NSH) listed on Autotrader for $69,995. I'd like to get more information about this vehicle and confirm its availability. When you see a first-year Mach 1 with the big block Cobra Jet V8 and cold A/C, you know this car had to be painted green because of the all the envy it generates. 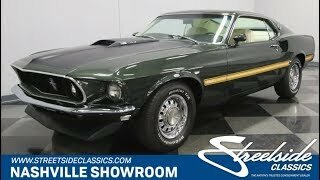 So look over all the details on this 1969 Ford Mustang Mach 1 Cobra Jet, but just know its a hot deal that will be going fast. The Mach 1 was the perfect canvas to showcase Fords refreshed Mustang for 1969. The body was stretched to have a meaner street presence, and this new premium package was not shy about its prowess. The Mach 1s looked ready for the track with standard flat black hood paint to reduce glare for the driver. And the large front air dam and hood scoop are great aggressive additions. The Black Jade green paint is factory-correct, and it represents a great gloss and shine to highlight the Sportback bodys excellent curves. Plus, the color has the perfect undertones to highlight the full yellow sports stripe package. Add in new chrome bumpers, bright trim, and GT wheels, and this is equal parts premium and performance. And that attitude is seen throughout this car. Ford was going upmarket with the Mustang at this time, and a great way to showcase that is with a pristine white interior. The doors, seats, and headliner all have an unmistakable look of premium. Plus, the woodgrain steering wheel matches the paneling on the dash, console, and doors, which all adds to the upscale ambiance of the Mach 1. In total, it looks like a time machine taking you back to 1969 right down to the Philco radio thats still on display. And the factory feature we know will really make this a comfy cruiser is the cold-blowing air conditioning. While the interior is a bit of a coddler, the engine bay is filled with brute force. This is an Q-code Mustang, which means it had a 428 cubic-inch V8 under the hood when it left the San Jose factory. Today, this still has the oh so desirable 428 big block under the hood. Because while it has a correct presentation right down to the decals on the bright air topper beneath that is a Holley four-barrel carburetor allowing this big V8 to inhale even deeper. And while this has a terrific growl out of the quad-tip dual exhaust, dont let this beast fool you into thinking it cannot be tamed. With power steering, front disc brakes, and a three-speed automatic transmission, this big block Mach 1 is quite an easy cruiser. Complete with Marti Report, this is the ideal mix of premium, performance, and distinction. So if you want to have it all, hurry up and grab this deal. Call today!! !